Madagascar’s most popular nature destination, Isalo National Park, lies amidst the Jurassic-era highlands of the country’s southwest. Established in 1962, it protects over 80,000 hectares of land dominated by a dramatic sandstone massif that has been eroded by time and weather into an otherworldly collection of plateaus, canyons, gorges and pinnacles. Iron and mineral deposits stain the rock formations a rainbow of different colors, and the dense forests and grassland plains that surround them are filled with unique flora and fauna. Hiking is the main attraction for visitors to Isalo, with trails taking anywhere from a few hours to several days to complete. The Isalo massif is criss-crossed with breathtaking hiking routes. Together, they offer the opportunity to encounter lemurs swinging through sunlit forest canopies; to escape the heat with a dip in a shaded natural swimming hole; or to visit the sacred tombs of the Bara tribe that traditionally inhabited the area. One of the most popular trails is the one that takes you to Piscine Naturelle, a limpid pool fringed by old-world pandanus trees and fed by a crystalline waterhole. This route is easily combined with a visit to the Canyon des Singes via a hike past the park’s multicolored ranges and through forest inhabited by diurnal lemur and sifaka species. 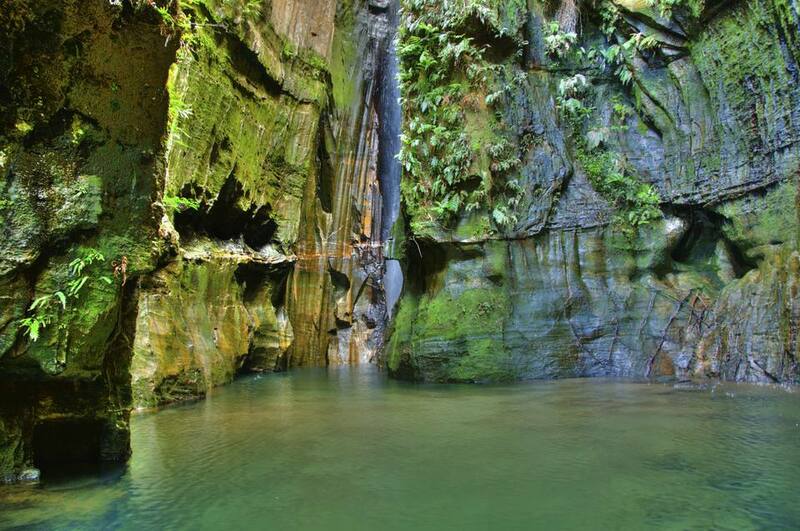 The Namaza Circuit and the Cascades des Nymphes trails also take you to beautiful natural swimming holes, while the Canyon des Makis et Rats route combines natural wonders with the cultural heritage of the Bara people. Choose this trail, and you’ll find yourself in a former royal village complete with the ruins of a palace wall, royal baths and burial places. For keen hikers with plenty of energy and high fitness levels, the Portuguese Cave route is the ultimate way to immerse yourself in Isalo’s Jurassic landscape. It takes you on a four-day trek to and from the cave in the far north of the park, through the Sahanafa Forest with its rich animal and plant life. Isalo National Park is more famous for its scenery than its wildlife, but that doesn’t mean there aren’t plenty of fascinating animals to look out for. Interesting mammals include Madagascar specials like the fossa, as well as two species of tenrec and two species of civet. The park’s pristine forests provide a home for no fewer than 14 lemur species, ranging from the iconic ring-tailed lemur to the endangered Verreaux’s sifaka. If you choose to stay overnight, you also have a chance of seeing nocturnal primates like the endangered Coquerel’s giant mouse lemur and the red-tailed sportive lemur. The park is also known for its reptiles and amphibians, with top spots including the endemic white-lipped bright-eyed frog, the endemic Madagascar boa and the fabulously patterned Malagasy rainbow frog. 81 bird species have been recorded at Isalo, of which 27 are endemic to Madagascar. The park is especially famous in birding circles as one of the best places to spot the endemic Benson’s rock thrush. Isalo’s plant life is equally unique. Botanists should look out for specials such as the elephant’s foot plant and the Aloe isaloensis, which takes its scientific name from the name of the park and its massif. If you're not traveling as part of an organized Madagascar tour, it’s relatively easy to visit Isalo National Park independently. You can pay entry fees, book accommodation and hire guides and porters at the park office, located in the nearby village of Ranohira. Hiring a local guide is compulsory, and fees depend on which trail you choose. As a guideline, you can expect to pay around Ar 80,000 (about $23.26) for a route that takes four hours or less; and Ar 120,000 for a longer route. Porters charge a flat fee of Ar 20,000 per day. Entry to the park costs Ar 65,000 for one day or Ar 110,000 for two days. All guides speak French and some speak English and/or another language. You can also hire off-road vehicles and drivers to take you directly to the trail heads. If you want to get an early start, consider making all of your arrangements the day before because the park office only opens at 6:30 a.m. Before heading into Isalo National Park, pay a visit to Maison de l’Isalo, a small museum dedicated to the region’s geological and cultural heritage located just south of Ranohira in the small village of Zahavola. The museum stays open from 6:30 a.m. to 6 p.m. every day and admission is free. Isalo National Park has a dry, tropical climate with very little rain and temperatures that frequently exceed 86 F/30 C no matter what time of year you visit. Because of this, it’s essential that you pack adequate protection in the form of sunscreen, sunglasses, light clothing and plenty of water. Unlike Tsingy de Bemaraha National Park, Isalo is accessible year round and there is no optimum time to travel in terms of weather. Be aware that the park can get busy during the peak tourist seasons (July to August and December); and if you plan on traveling during these times, it’s a good idea to book accommodation well in advance. There are two large campsites within the park, both of which offer shared toilet, shower and barbecue facilities. Spending a night at one of them is a great way to experience the park in all its rustic glory—especially as the campsites are often visited by ring-tailed and sifaka lemurs. If you don’t feel like camping, there are several excellent hotels located along the park’s southern border. The best of these include Le Jardin du Roy, Relais de la Reine and Isalo Rock Lodge. The first two options are very similar, with stone bungalows set amidst lush grounds and a full range of amenities including a Malagasy restaurant and spa. Both offer horseback riding and via ferrata excursions within the national park. Isalo Rock Lodge has 60 beautifully decorated rooms, all with luxurious ensuites, a private balcony overlooking the park’s splendid rock formations and access to a restaurant and pool bar. The town of Ranohira is the gateway to Isalo National Park and the closest big cities are Toliara (150 miles/241 kilometers to the southwest) and Fianarantsoa (170 miles/273 kilometers to the northeast). All three settlements are connected by the RN7, Madagascar’s biggest and best maintained road which makes access to Isalo easy. From the Madagascan capital, Antananarivo, it’s a 15-hour drive to the park along the RN7. Consider making a trip of it and stopping along the way at other Madagascar highlights such as Ranomafana National Park and the ex-colonial city of Antsirabe. Alternatively, there are daily flights from Tana to Toliara; and from there, you can hire a car or take a taxi-brousse to Ranohira. If you choose to self-drive, don’t forget to stop off along the way at La Fenêtre de l’Isalo, a natural rock window on the park’s southern border that’s famous for framing the setting sun.